A robotic spacecraft launched in September to return samples from an asteroid will spend about 10 days this month on a side job hunting for asteroids that may be accompanying Earth as it orbits the sun. So far, scientists know of only one so-called Earth Trojan asteroid, which was discovered in 2010 by NASA's infrared WISE telescope. The 1,000-foot object, known as 2010 TK-7, orbits roughly 60 degrees ahead of Earth. 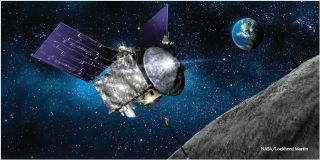 Osiris-Rex will pick up the hunt on Feb. 9, searching 60 degrees ahead and 60 degrees behind Earth's present position. These regions, known as Lagrange points, are among several locations where the gravitational tug-of-war between Earth and the sun balances out, making for potentially stable orbits for asteroids or other objects. NASA, for example, plans to position the James Webb Space Telescope, its follow-on to Hubble, at a Lagrange point about 1 million miles from Earth. Jupiter has a large group of Trojans in tow, bodies that scientists say are key to understanding how the solar system formed. Could similar primordial asteroids be circling Earth? "That would be the most fascinating thing we could discover," Osiris-Rex lead scientist Dante Lauretta, with the University of Arizona's Lunar and Planetary Laboratory told a NASA science advisory group last month. Compelling as the science may be, Lauretta authorized the moonlighting job because it provides an excellent dress rehearsal for some key sleuthing Osiris-Rex will do to help ensure its safe arrival at the asteroid Bennu in 2018. Astronomers don't know if Bennu has any small moons in orbit. Ground-based telescopes can only spot objects larger than about 65 feet. "That's a substantial object and we'd obviously want to know that it's there and plan our operations accordingly," Lauretta said. Osiris-Rex is due to put itself into orbit around Bennu for a two-year study and sampling mission. For target practice, as Osiris-Rex hunts for Earth Trojans it will attempt to locate several known objects in the main asteroid belt. "It's a great opportunity to exercise the operations system," Lauretta said. Osiris-Rex's detective gig will run from Feb. 9 through Feb. 20, with two days off due to spacecraft thermal issues. WATCH VIDEO: Does the Earth Have a Second Moon?